Hiram Larew, right, traveled a lot with his job. 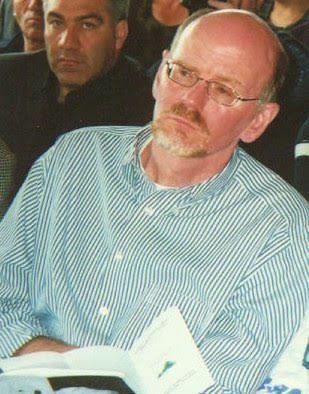 Here he is pictured in Egypt in 1998. Hiram Larew worked with the USDA and the USAID. Now that he is retired, he uses poetry to fight hunger. Larew spent his professional life fighting hunger and promoting innovative agriculture around the world. Born and raised in Virginia, he studied horticulture and botany, earning a Ph.D. in entomology. He began his career as a research entomologist at the USDA facility in Beltsville, Maryland. There he spearheaded many important science projects including research into the control of the leafminer, which at that time threatened to destroy acres of U.S. vegetable and ornamental crops. In this early phase of his career, he learned about neem seed extract which, while little known in the Western world, had been used for centuries in India and elsewhere to control insects and cure human ailments. His interest in solutions from abroad began when he found that the extract was very useful in controlling leafminers and a host of other pests including some plant diseases. After 10 years with the USDA, he transferred to the U.S. Agency for International Development, where he helped advise on the safe use of pesticides around the world. He also led efforts to strengthen colleges and universities in developing countries as well as ensure that people with disabilities were treated more fairly and respectfully in poorer countries. Eventually, he returned to the USDA as a director of the international team in the National Institute of Food and Agriculture. There, Larew helped guide Extension-building programs in countries like Afghanistan, Haiti, Armenia and elsewhere. He also facilitated youth programs such as 4-H as they were offered around the world. “American youth programs like 4-H are the envy of the world,” he said. His team also hosted visiting groups of farmers from South Korea, the Caribbean and Africa as they toured farms in the U.S., and reciprocally, as American farmers traveled to Central Europe or other world regions to learn first-hand of successful practices. Larew became adept at encouraging the exchange of ideas among men and women from different cultures, all speaking different languages, but sharing an abiding respect and love for the land and agriculture. After retiring in 2015, Larew volunteered with the Farm Journal Foundation’s Lead Farm Program, which brings well-respected American farmers to congressional hallways as advocates for hunger alleviation around the world. 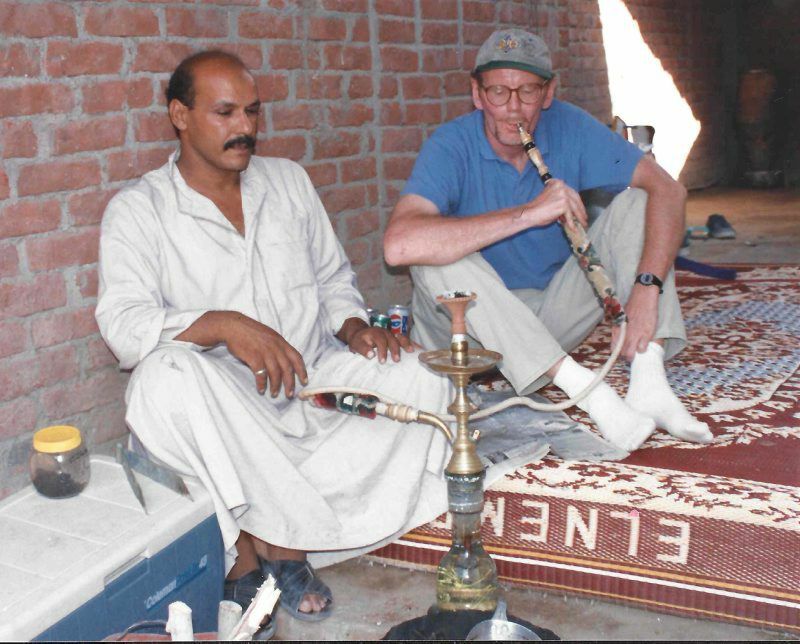 Throughout his career, “I tried to find useful connections across country borders that should have existed but didn’t,” Larew said. And that theme, building those connections, links or bridges has guided his activities since his retirement. Building bridges of communication remains central to Larew’s life, particularly a bridge between his lifelong work on alleviating hunger and his expanding role as an American poet. Larew was already a recognized poet in the Mid-Atlantic region by the time he retired. He has several published collections of his poems in bookstores, and often participates in poetry readings and conferences around the country. “When I retired, I realized I’d never brought my two worlds together,” Larew said. During a weeklong writing trip to Ireland, Larew studied and wrote poems about the Irish Potato Famine and what emerged from that experience. Those poems were the idea of an informal initiative he calls Poetry X Hunger, where he uses poetry to fight hunger. “I believe poetry and the arts have a lot to contribute to preventing &tstr; even eliminating &tstr; hunger. Rarely did I see the arts included in hunger alleviation programs. But you can’t get to that ‘culture’ in agriculture without the arts. Poetry X Hunger encourages poets to write more about hunger,” he said. Through his connections with USAID, he was able to bring his project to the attention of the United Nation Food and Agriculture Organization. They agreed to underwrite the First Annual World Food Day Poetry Competition in 2018. Poetry X Hunger directed the competition and selected the winning poems from among the submissions from Washington, D.C. and seven other countries. The winning poems were showcased on the organization’s website. Larew is building bridges between farmers, nations and poets. He is using his experiences with different cultures and people to continue to fight hunger across the globe and to encourage cultural expression, namely through poetry. The “bridging” retirement plan allows Larew to establish durable and valuable links between those fighting to end hunger around the world and those fighting to give a voice to the suffering and the joy of living. This is one in a series of occasional articles on farmers and agriculturalists of an age when they undertake new chapters in their lives, once covered under the misnomer “retirement.” Each article looks at how one person has handled setting aside their work and career, and tackling life’s next chapter. What an interesting man. After reading this article, I’d love to sit and listen to him tell his stories of overseas. I was also amazed at how his combined poetry with world hunger. Loved the article! !